On his TUMEKE! blog,Martin ‘Bomber’ Bradbury says he would have given the following speech to welcome the launch of a new left wing party, the possible launch of which has been widely speculated on during Matt McCarten’s Mana campaign. The passage quoted at the start of Bradbury’s post is from Chris Trotter’s latest column on Stuff. OPINION: Another Aotearoa Is Possible – that’s the hopeful title of a conference getting under way in Mangere tomorrow morning. This grand political hui – featuring some of New Zealand’s leading leftists – was conceived with not one, but two agendas. Or, to employ the steely jargon of yesterday’s revolutionaries: a Maximum Programme and a Minimum Programme. For the Maximum Programme to prevail, radical Unite Union leader Matt McCarten had to attract 5 to 10 per cent support in last Saturday’s Mana by-election. If he’d ended the evening with 1200 to 1500 votes, Te Wananga O Aotearoa’s Mangere campus – the conference venue - would almost certainly have witnessed the birth of a “New Left Party”. Unfortunately for the conference organisers, Mr McCarten ended up attracting the support of just 3.6 per cent of Mana voters. This failure to surpass even the 5 per cent MMP threshold means that tomorrow’s conference agenda will default to its Minimum Programme: “A day of dialogue with activists against injustice and inequality”. We live in extraordinary times. The current global economic crises is unlike anything since the 1929 stock market collapse which spawned the great depression. We face a crises ‘of’ capitalism as the unregulated neoliberal greed of corporations has been allowed to replace managed Keynesian economic theory. In the 1970s the real economy and the financial economy were evenly valued but 40 years of deregulation, low tax, free market dogma has seen the real economy valued annually at $8 trillion while the financial economy is valued at $330 trillion, that disconnect between reality and the inflated bubble world of finance has gone pop, we must reconsider the rules of the game because the unsustainable consumer culture of SUVs, plasma TVs and cosmetic surgery all on the credit card game is over. NZers don’t need to have a university qualification in economics to understand what is happening to them, they feel the reality every single week. After the gst tax rise, half say they are worse off now and that imbalance of inequality in society has only a negative impact which bears a terrible harvest in our communities. These concerns for an equitable society demand political expression. Why shouldn’t beneficiaries and those on minimum wage have political expression in the rooms where the decisions that effect them most are decided? This economic crises is unique and the poor will not be represented when the elites decide what must be done and those parties who do lean left need to have a political partner at the table who forces them not to forget the concerns of an equitable society once they are elected. A new party on the left with social equity at its philosophical heart focused on making sure any changes benefit those on the bottom most would need to tap into every beneficiary support group and every minimum wage organisation to push myopically for the party vote. There are 338 000 beneficiaries in NZ, there were 2 376 480 votes in the 2008 election, those beneficiaries represent 14% of that vote, a new Political Party needs only 5% to gain representation, add those on minimum wage and a clearly defined Party with the concerns of beneficiaries and those on minimum wage foremost at their political manifesto can pass the 5% threshold, it’s as simple as that. Matt’s courageous last minute charge at the windmills in Mana must not be held up as the bench mark to judge the appetite for those with the least having political representation. The anger at how those on the bottom are being asked to do with less while the Sam Morgans of NZ arrange their finances to minimize their tax obligations is ripe for expression from those who must bear the brunt of public service cut backs. Forcing solo mothers, the sick, the mentally unwell and disabled back to work in a 6.4% unemployment environment while those on the minimum wage are disempowered with every passing week should anger every NZer who has a passion for social justice. Despite all that, nobody came to the Tax Justice seminar at Another Aotearoa Is Possible. This is true, no one did come to the Tax Justice workshops. 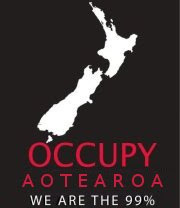 It would be good if some of the activists from the Workers Party, Socialist Aotearoa, Unite Union and other groups got in behind the Tax Justice campaign. I do find the gap between support from some good activists and the popular support from the people on the street very frustrating. It's the working class people in South Auckland for instance, where the conference was held, who are expressing strong support for GST off food and a tax on financial speculation. Should we not listen to this and use it to build a connection between the left and grassroots people? Should we not use support for GST off food to undermine GST and popularise a Financial Transaction Tax or similar? Should we not use popular campaigns that target key neo-liberal mechanisms to get ourselves known to broad numbers of people? So we can talk to them about other things, as well and build up some kind of support base for the challenges ahead that will require a radical transformation of the economy and everything else. I'm certainly determined to push on with the campaign and see what can be achieved. I will continue to be in dialogue with the relatively small number of activists at the Unite organised conference about supporting the Tax Justice campaign. I would certainly welcome a shift in attitude. Join the 'No GST on Food' Facebook page. http://www.facebook.com/#!/pages/No-GST-on-food/119541161411953. Over 5,700 people already have. The petition works on a number of levels. I know that as I have taken it out to the public. A few disjointed thoughts. We can sit idley by and let neo-liberalism be put back together and wait for the events of 2008 to recreate themseolves or we do something to promote an alternative approach which puts people and the planet first. Academic debates are interesting things and have their place. We don't have exact answers to what that alternative should look like and even less idea of exactly how we get there. However, that debate is ongoing with a firmer conviction than for many years I would suggest. I am not sure 'average punter' on the streets cares whether Bernard Hickey has had an epithany about the failure of neo-liberalism or whether the CTU has a very useful alternate exconomic position paper. Some material facets of life are likely to appeal to them more, like GST off food that is paid for by some tax on speculative investment (the latter also promising some regulatory benefits for the economy as well. 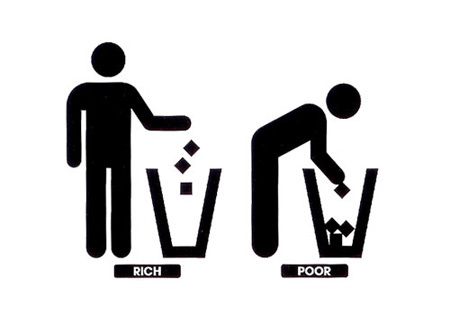 Raising the issue feeds into the debate about a better political-enviro-economy. If successful enough, it may also help shift the general public debate leftward. It also reminds people that what they are presently being offered is not working and their material conditions of life are being erroded. It also stirs up discontent about neo-liberalism, and as a nice aside, the National Government that typifies the N-L project and may cost them some votes. Finally, it is fairly easy to get people engaged with other issues using this petition (like Fairness at Work). Whether you are anti national, or pro Labour, or anti neo-liberal, or pro workplace fairness, my experiences to date with this petition is that it (1) reminds people that they are pissed off about GST, (2) helps cost the present govt some votes, (3) helps people trabnslate their anger into some action, (4) facilitates engagement with people about some wider economic & social issues,(5) promotes the debate about alternatives to neo-liberalism. It is also easy to get people signing. Maybe it'd be good to step back and see why that is. We've had quite a lot of backwards and forwards on our open list about the campaign. But personally I was involved in the $15 minimum wage campaign, that attracted just as much support as your campaign is. However it ended at passive support. It was ultimately carried by the far Left and not the working class itself. My focus is to build the left, through Unite and a few other projects. The worst thing to do right now is to do the same thing again. That's what you're doing. It might feel good, but it is not actually changing anything. The $15 campaign collected between 200,000-150,000 signatures and for most people in Porirua when I was campaigning had no idea that the campaign had happened. With no clear follow-on or take-up how is your campaign going to be any different? The other thing about it is the timidity. I got excited when I saw Matt McCarten's campaign but your campaign doesn't excite me at all. Thanks for your comments Joel. Of course a campaign either excites people or it doesn't, and that's a key factor in a campaign achieving buy-in from a broad range of people that gives it any chance of success. The thing for me, and others who've fronted the Tax Justice petition on the streets, is that it's quite exciting to working class people. I collected over 1,000 signatures for Unite's $15 minimum wage petition in Whangarei, I never got signatures as quickly or as easily as I can with the current Tax Justice petition. And the conversations with people about GST off food and the idea of taxing financial speculation, which confronts the whole edifice of finance capitalism, have been great. The Tax Justice petition confronts a core aspect of neo-liberalism, which the right will be loath to concede on. But they're having to, like for instance the leadership of the Labour Party, because of the popularity of the GST off food campaign (which started in 2008 with RAM). This campaign has actually undermined GST, which no longer has the aura of sanctity that both Labour and National had sought to maintain. We're actually quite pleased that a handful of activists and a mass of popular support has achieved this. Though of course we're a long way from achieving the end goal. So I disagree totally with your comment that we're not changing anything, and which is incorrect of Unite's minimum wage campaign as well. One of things that the campaign is changing - whether it succeeds or fails - is the people involved. That includes the activists learning to give leadership to a popular campaign, work within a coalition with others, deal with the media, and heaps of other stuff that just has to be done to be learnt and a level of confidence obtained. Then there are the people who've signed the petition, got a few friends or family members to sign it, had a conversation on the street about the campaign, they're consciousness is changed as well. It's all steps in a process which keeps an essential dialogue happening between activists and grassroots people in these times of intensifying capitalist crisis. 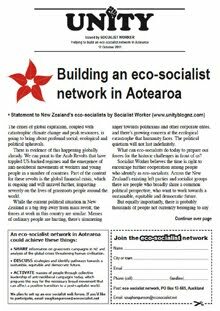 While it would be good to get support from the Workers Party, Socialist Aotearoa and Unite Union for this campaign, and maybe it's there at the level of "good luck with your campaign", it's not essential. 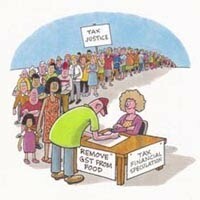 The Tax Justice campaign is still achieving some success, with hopefully more to come, who knows. I'm interested if the Workers Party has got a position on whether it supports a Financial Transaction Tax. As a "transitional demand", or however else you might want to conceive it, I think it has a lot of merit. It was part of Matt's by-election campaign obviously. Our strategy is to try and popularise an FTT, the more radical demand, on the back of mass popular support for taking GST off food. I think it's a good strategy. GST's "aura of sanctity" - what are we in here - the middle ages? When Labour introduced GST there was a fair bit of grizzling, mostly about how complicated it was to administer if a small business registered for it. Because the union movement had its tail very much down then, and because Labout had done the deed there was not much clear class opposition expressed. Workers generally accepted GST with a grudging fatalism. Noone sanctified it, then or since. You guys have invented a windmill and then claimed to destroy it. Your quite correct to say that workers generally accepted GST with a grudging fatalism. But the phrase "aura of sanctity" refers to Labour's and National's efforts to promote the idea that GST was a simple and fair tax that was the envy of other countries because it was universally applied. Our statement in this regard is quite accurate. The situation has changed. There should be some recognition of that, because it might give people the confidence to believe that more can be achieved.